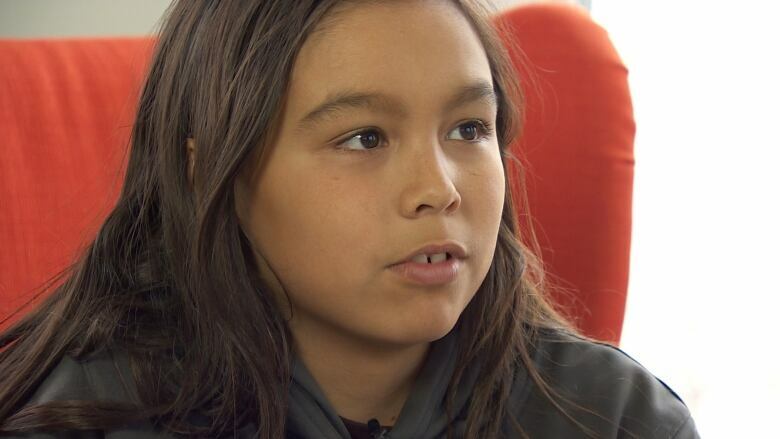 Miles Brewster, 12, says he ended up in the principal’s office after he sat during the Canadian anthem to make a statement about the residential school curriculum. A 12-year-old student in Iqaluit says he ended up in the principal's office after he sat during the Canadian anthem to make a statement about how the history of residential schools is taught. "I guess I just wanted to make a statement for... changes in school," Miles Brewster said. "Like more education about the past… like what happened to the First Nations and Inuit. They had to go to residential school." It started on Sept. 30 — Orange Shirt Day — a day dedicated to survivors of Canada's residential schools. Miles was having a difficult time in school and his mother, Janet Brewster, says he was disappointed when his class didn't talk about the reason they were donning orange shirts. "He thought that it was really ironic that they were asked to do that, yet he's... not learning about our lived history as Inuit," she said. "Miles has been having concerns with what's going on in his own classroom. And has felt that it hasn't been a very safe or respectful environment for him." Brewster said she and Miles have always had an open discussion about her mother and stepfather's experiences in residential schools. Miles is named after Brewster's stepfather, who died by suicide after years of struggling to cope with the abuse he suffered at residential school in Inuvik. "As Inuit, we always tell the story of who you're named after," Brewster said. "He knows about the impact of the residential schools through the story of his name." When Miles was struggling with issues in his classroom at Iqaluit's Aqsarniit Middle School, Brewster encouraged him to feel empowered to act in a respectful way to ask for change. "In his own small way, he's taking some control and doing that in a way that's not disturbing his classmates," Brewster said. She said she was called by the principal when Miles refused to stand. "They were concerned that Miles was being inappropriate by sitting through the anthem." But Miles says he'll continue to sit. "I sat down for the anthem to make a statement. I got sent to the office for that, because I think my teacher thought I was trying to be a troublemaker," he said. Miles said he got "a little scared" when his teacher raised his voice when ordering him to the office, but he doesn't plan to stand again any time soon. "I think we need a change. More education, more Inuit as teachers and school staff." Brewster is supporting her son. "This is the time in age and education where you can very easily lose a student. This is, Grade 7 and 8, is really key to keeping those children engaged so that they feel excited about school and they see what the benefit is of staying in school," she said. "I don't want his experience to change from being really positive into school being something that he dreads." Neither the school's principal or the Nunavut Department of Education would comment on the situation.